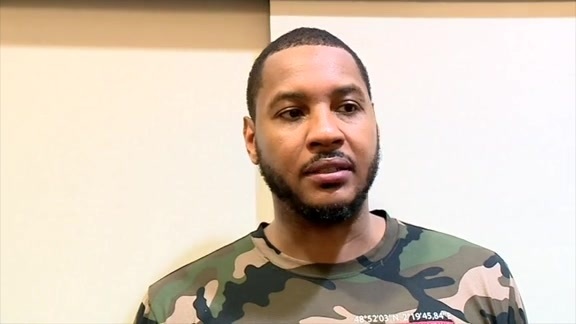 All confidence and no hesitation brimmed from Carmelo Anthony as he rose and fired three times in the first three minutes on Monday night against the Sacramento Kings. The net snapped three times, twice more than it did the entire game for Anthony on Saturday night against the San Antonio Spurs. But that’s Anthony, one of the most gifted and prolific scorers in NBA history. For Oklahoma City’s benefit, he came out blazing in the Thunder’s 106-101 victory. Anthony hit five three-pointers in total on seven attempts on Monday, part of a 21-point night and 16 total three-pointers by the Thunder in the game. As a counter to Sacramento’s strategy of packing the paint, Head Coach Billy Donovan lined his team up for catch and shoot three-pointers throughout the evening. His team delivered, knocking down 44.4 percent of their looks, set up by expert passes from Russell Westbrook and Paul George in addition to forceful screens delivered by Steven Adams. @the2kferguson joins the party. OKC has 15 of them as of midway Q4 vs Kings. As the three previous matchups this season were against the Kings, tonight’s game was yet another battle for the Thunder, and one it almost didn’t escape. After building a 10-point lead in the opening quarter, Donovan’s group was unable to completely pull away, as scoring for both teams came to a near standstill towards the end of the first and beginning of the second quarter. By halftime, however, the Thunder mustered a six-point lead behind three consecutive three-pointers, two by George (21 points) and one by Westbrook. After halftime, the Thunder’s defense fell by the wayside, in part due to second chances allowed but mostly because of some missed assignments and rotations. Sacramento got backdoor cuts for layups, scoring 20 points in the paint in the period, and knocked down wide open three-point attempts. Suddenly, the Thunder trailed by one heading into the final frame. In the fourth quarter, even without Steven Adams who left the game with a hip contusion, the Thunder refocused and centered itself back into its defensive principles. Sacramento shot just 7-for-18 (38.9 percent) in the fourth quarter, and the Thunder got timely baskets from a variety of sources to keep the Kings at bay until the end. “Our guys were able to self-correct and get back to playing the level of defense that we played for the majority of the game,” Donovan said. After not playing in the first half, guard Alex Abrines popped off the bench in the fourth quarter to deliver 6:37 of crucial playing time. He knocked down both of his three-point attempts in the final frame, including one from 29 feet with 4:40 to go from George that put the Thunder up by 9. After a Kings three, Anthony squared up on the wing like he’s done a thousand times before and lulled his defender just enough to drop a 16-foot jumper through the hoop. Westbrook knocked down a jumper with 3:33 left to make it an 8-point game, and then two possessions later, the Thunder’s newest jack of all trades Corey Brewer came up with a deflection and steal that led to a Westbrook-to- Jerami Grant run-out alley-oop that sent Chesapeake Energy Arena into hysterics. The basket gave Westbrook his 20th triple-double of the season, and 99th of his career. Sacramento didn’t stop to celebrate, however. Besides one Westbrook layup the Thunder had a turnover and three missed shots on its ensuing possessions the Kings were able to chip away at the lead until it became just 3 points with 23.7 seconds to go. Brewer, who scored in double figures once again with 16 points, knocked down both of his free throws. One stop later and the Thunder sealed its victory, moving to 40-29 on the year, its highest mark above .500 all season.